Recent studies have revealed that semiconductor nanowires offer unique advantages for a wide range of applications. An EU-funded project is breaking new ground in the move towards sustainable and efficient energy harvesting by exploiting the unusual properties of these tiny yet highly controlled structures. With radical new technologies that change the way electricity is being generated and used, one of the most important issues will be to increase efficiency and reduce the cost of energy produced. Nanotechnology opens up fundamentally novel routes to address the above challenges. In particular, semiconductor nanowires are hailed as being a revolutionary super-material that can increase cost efficiency, while reducing the amount of material needed for energy conversion. Spurred by the exciting potential of nanowires, researchers established the PHD4ENERGY project. The project offered the opportunity to 12 Ph.D. students to conduct collaborative interdisciplinary research in the nanoscience field. Over the last years, research on semiconductor nanowires has helped enhance understanding of atomic-scale structure and reveal novel physical phenomena at the nanometre scale. 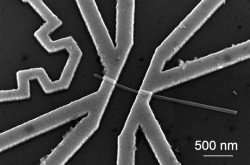 "Semiconductor nanowires offer the possibility to easily combine materials in epitaxial growth. For example, this allows more freedom in material choice when designing multi-junctions or heterostructures in contrast to planar devices and thus could lead to higher efficiencies in simpler structures," notes professor Linke Heiner. "Micro-cracks that are formed in planar solar cell modules when materials do not fit together are one of the main sources of energy losses," further explains Heiner. Other advantages when using nanowires include the ability to fine-tune their interaction with light. Nanostructures are efficient absorbers of light and can act as 'antennas', harvesting far more light and therefore can use far less material, increasing sustainability. The fact that they can pull in light from around them paves the way for large-scale photovoltaics using only a fraction of the material. Exploiting the small diameter and cylindrical geometry of tiny wires made from III-V semiconductors, the project team successfully designed unique device structures such as axial and radial heterojunctions. The advantage with this approach are that the conducting properties can be modulated along the length or across the radius of the nanowire. Another important achievement towards highly efficient, nanowire-based multi-junction solar cells includes the design of nanowire tunnel diodes known as Esaki diodes for use in tandem solar cells. A significant part of their work was geared towards the design of nanometre-sized LED structures. For visible-light LEDs, the III nitrides—indium gallium nitride—are very suitable with band gaps in the visible range of photon energies. These phosphor-free LEDs helped achieve longer-wavelength light emission for white light. Researchers have also conducted thorough studies on advantageous nanowire thermoelectric properties. For example, they showed for the first time in experiment that heat can be converted into electricity with an electronic efficiency on par with that of optimized power stations. In lock-step with all the above application-targeted activities, the Ph.D. students also explored the safety of their nanowires, checking for potential toxicity. PHD4ENERGY investigated new concepts and technologies that point the way towards developing next-generation photovoltaic systems and efficient light sources. With focus on the employability perspectives of doctorate holders, the project promoted collaboration between students and the industry through a training programme at Lund University. A major success was also the 2016 Ph.D.4Energy Summer School on nanoscale energy converters that hosted outstanding and internationally visible invited lecturers. This was attended by a great number of graduate students and post-docs.